Forget nodal music as set-it-and-let-notes-come-out algorithms. 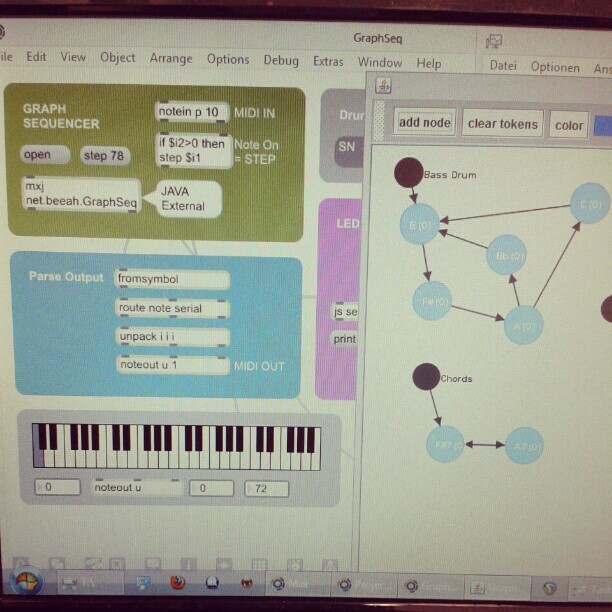 Here, a network of nodes lets a drum kit spawn melodies. Photo: Sebastian Arnold, courtesy the artist. Left to right, beginning to end, the same in a loop — there’s no reason music has to work this way once you’ve got a computer. But if you associate generative or algorithmic music with some sort of magical black box machine you switch on, an automaton spitting out notes while you sip tea and stroke your beard, think again. Here are two examples that use interactive structures as a way to make music more live, not less. One is the latest creation from the ingenious mind of monome creator Brian Crabtree (who, perhaps unexpectedly, seems to have redirected the course of the entire industry to light-up grids). Awaiting a Max patch from Brian is a bit like awaiting the latest Thom Yorke record … erm, at least in the music nerd world. The second example, though, goes a different direction entirely: the product of the hacklab CDM hosted at CTM Festival last month, it uses generative structures to let a drummer conduct interactive melodies while playing a conventional kit. The contrast between the two shows just how wide the world of interactive music, concocted in networked nodes of notes, can be. First up, for monome – and other grid controllers – Decisions. decisions from tehn on Vimeo. Imagine, for a second, the musical score. You take for granted that each note is connected to the note after it – to the one on the right – and that you advance from one to the other at a steady speed. Think of that instead as a single chain of nodes. If you changed the rules, you could take that same chain and go sometimes right, sometimes left, or even separate the one strand into multiple, connected strands, a network of note nodes. That’s the idea behind nodal music structures. generative maze run. 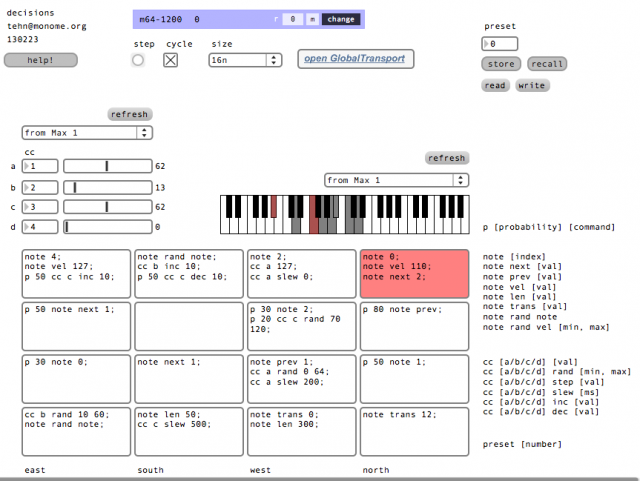 trigger scripts to make midi note and cc data. for grid devices, written using max6. triggering the fantastic aalto by madrona labs. And if none of this makes sense, you can grab this and use it with your grid controller – monome, Launchpad, Ohm, APC, Push, whatever – and a copy of Max 6. [My] proposal [for CDM’s hacklab at CTM Festival] was accepted and I spent the week on CTM Festival building the prototype as a Java External for Max/MSP. The Hacklab was a very inspirational gathering of music, art and visual developers collaborating within their projects and sharing ideas and concepts. For example, Imogen Heap was working with her team on their exciting musical gloves project. I set up an electronic drum kit and my stage LED Light modules as an interface testing environment. In many conversations with other artists in the lab I developed a basic concept for the interaction between the drum kit and my sequencer prototype. This is not a standard step sequencer. The system interprets each incoming signal – in this case, from drum hits – and uses them to make choices (“decisions,” again) about traversing a network of notes. (Markov Chains, anyone?) 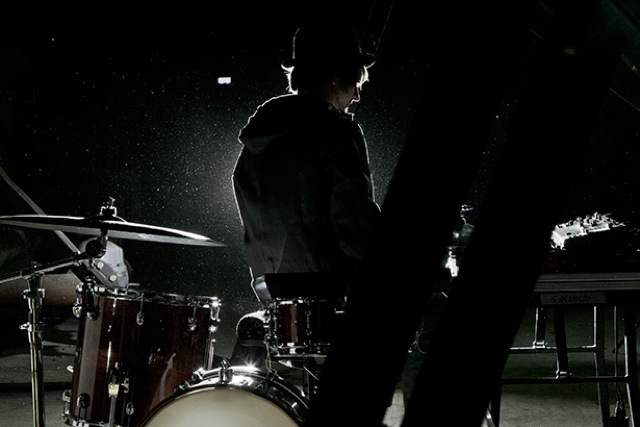 The incoming hits act as “emitters,” making the player more active in that decision model – and the upshot is drum kits (or other inputs) playing melodies. The player can form a duet with herself, playing and navigating a composition all at once.